This was one of those games that neither team, nor any one player, really dominated; but overall the Stars came out on top because they were able to somehow eke out those few extra runs here and there which got them over the line first – Tammy Beaumont (47) made a few more runs that Hollie Armitage (43); Bryony Smith (31) made a couple more than Lauren Winfield (29); Alex Hartley (2-18) was that bit less expensive than Jenny Gunn (2-19). 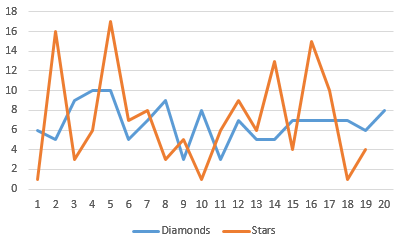 The “Over by Over” graph (above) is interesting because it shows the Diamonds cruising along at a pretty steady pace throughout their innings, at a minimum of 5 and a maximum of 10 per over. In contrast, the Stars innings was all highs and lows – three Diamonds overs (1, 10 and 18) conceded just one run apiece, whilst 3 others (2, 5 and 16) went for 15 or more. From the Diamonds’ perspective, perhaps eliminating 2 of those 3 expensive “peaks” could well have won them the game; but to be fair only in hindsight could you have predicted that Katherine Brunt, whose first two overs had conceded just 1 and 3, would suddenly go for 17 off Bryony Smith in her third; or that Steph Butler, who had bowled 2 overs for 10 up to that point, would disappear for 15 off Tammy Beaumont in her third. I think one difference was that the Stars played a bit more calmly and kept their focus. Diamonds panicked a bit at times with the bat and struggled when Stars pegged them back after an excellent start. There seems to be a hint of desperation and recklessness to Diamonds’ batting and bowling which is hampering them quite a lot. They were 72/0 after 10 overs and really should have scored at least 150 from there. The dismissals of the experienced Mooney and Blackwell were somewhat inexplicable, the former taking a run that was never there to a known good fielder (Sciver) and the latter playing a rash shot to a straight ball when she was just getting going. I know it’s T20 but probably not what you’d expect from supposed linchpins. It was a similar story in the field. After a good start from Brunt, Spragg couldn’t find her radar then Brunt lost hers in her final over. Ismail hasn’t settled either, she should be bowling 4 overs. Those 11 wides (compared to just 2 for Stars) made quite a difference in the end as well. Jenny Gunn cut a frustrated figure in the field, despite claiming a very good bowling return of 2-19 off her 4 overs. She did not want to accept the umpire’s decision of not out after an LBW appeal. I actually thought Gunn might get censored again for her behaviour but thankfully it doesn’t look like that happened. It’s a shame Diamonds have made a poor start as I’d like to see them get on the board, and it’s going to to be tough for them against Southern Vipers on Monday, who’ve made a great start and look like probably the strongest side.